Chemical Industry - NCD Separation Solutions Ltd. The exposure to hazardous products, solvent based suspensions and wash liquors, by centrifuge operators must be minimised, if not completely eliminated. Basket filtration centrifuges are commonly used as a means of processing such material. As the demands to alleviate operator exposure to such products increases, and as the exposure limits to solvent vapours decrease, centrifuge design engineers face difficult constantly changing challenges. 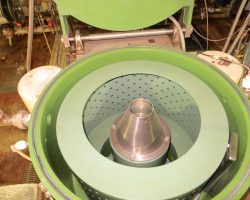 The challenges faced by centrifuge design engineers are to ensure full containment of the solid and liquor phases throughout the separation processing cycle as they safely enter and leave the centrifuge. In addition to minimising operator exposure limits, it is also important to minimise any physical handling of the products so as to avoid contamination of the operator and the product from the environment. Basket centrifuges are fully equipped with such mechanisms. We have the knowledge and understanding to help our clients fully integrate these centrifuge types and such import systems into their industrial centrifuge processing operations. 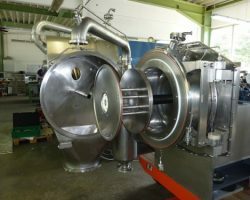 NCD Separation Solutions Ltd. is a unique company that can offer a complete range of centrifuge consultancy and centrifuge engineering services.